Gorgeous Home with luxury amenities such as a pool, grilling area and deck area for entertaining. 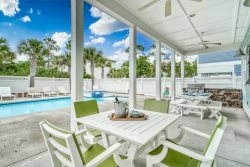 Perfect Home for a family vacation in Seacrest Beach! This new home and carriage house provides the ultimate vacation experience. Located less than 500 feet to the deeded beach access, the home is situated just a short bike ride from the communities of Alys and Rosemary Beach as well as the HUB. One of the features you will also adore is a glimpse view of the Gulf from the home. The main house features 3 bedrooms, 3 baths and 2 half baths, all with king beds and TV’s. There is also a large bunk room with 2 twin over twin bunks plus a kids loft or second living area with couches and TV. The master, located on the first level, makes it ideal for those who prefer not to navigate stairs. The master en suite has a large TV, double vanity, soaking tub and walk in shower. The Chef’s Kitchen features Quartz counter tops, Sub Zero refrigerator, Wolf Range, Ice makers and a farm sink with an 8’ Island for entertaining. Shiplap Paneling through main house makes this a must see. Your family will enjoy entertaining in the open concept living, dining, and kitchen area. The extensive porches overlooking the pool area are excellent for outside dining and relaxing. Curl up with a good book on the swing bed. As an added bonus, the carriage house provides additional room to spread out. Featuring master bedroom, bath, full kitchen and living area with a covered porch overlooking the pool and spa. The master suite includes a walk in closet, king bed with large TV and en suite bath with double vanity and walk in shower. There is also a bunk room with a twin over twin bunk and pocket door for privacy. The home’s outdoor areas are sure to enhance your vacation. A 34 X 16 private heated Pool with Spa and deck fountains, an outside grilling area and plenty of patio space provides the perfect retreat at the home after a long day at the beach, which is steps away with perfect easy access You will also love the convenience of the 2 outdoor showers and half bath, both located right near the pool. No need to walk through the house for kids to use the restroom anymore. This home is being professionally decorated by the infamous, 2 Hags Swag and built by Romair Construction These companies are known for their quality craftsmanship and beachy chic décor. 2) VERY IMPORTANT - WE DO NOT ACCEPT WIRE TRANSFERS. 3) 5 complimentary bikes are provided with this home. Waiver must be signed before use of bikes is granted. Very attentive, professional and quick to respond. We had a wonderful family vacation at "Tidey Whitey." The main house was very clean & spacious with everything you need. The laundry room/mudroom was a great added bonus. The pool & outdoor was a wonderful space. The carriage house was a perfect addition to the main house. Thank you for your help. The home was brand new to the rental market and your team helped work out the kinks. Great job! Unbelievable home. Everything you could want for a multiple family vacation. Incredible style, comfortable in every way, convenient to everything. This home offers the easiest beach access you will find without being beach front. Private pool with grill and screened in porch is perfectly set up for bar-b-que and swim with kids and friends. Will definitely book again, no brainer. Beds very comfortable. Clean. Great location. Smooth transaction, easy to book, easy to communicate with. Fabulous rental! Gorgeous rental, great setup for large families.